The hugging, kissing, back-slapping dispensed with, the crowds proceeded to G-11 and accommodated their extended posteriors into the “new” bucket seats of the room. The benches of yore had been replaced. I could hear many-a-sigh from the gathering. Clearly, this G-11 was not the G-11 without the benches! Benches we would thump at every action scene of the movies we saw here, benches we would thump when the local favourite gave a crackling performance during one of the many contests during a “Kashi-Yatra”. The serious bit was about to begin. 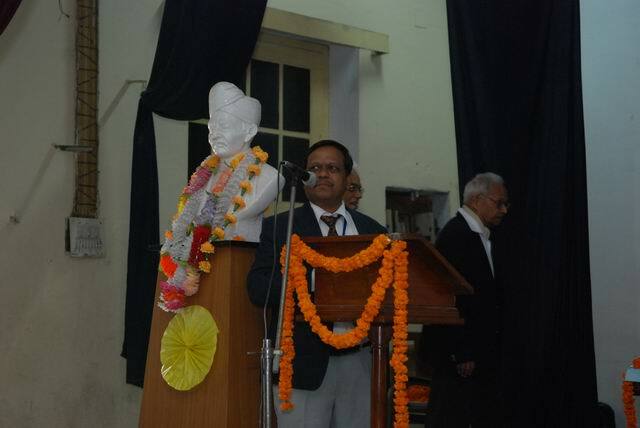 Venerable professors like Prof Tripathi, Prof S. N. Upadhyaya, ex-director IT-BHU, Prof K.P. Singh, Director IT-BHU and Prof Veerendra Singh, Dean IT-BHU, were on the stage along with the founder of our e-group Salil. Balloons and malas all over the place. The crowd of some 180 or so in the audience all agog with excitement. 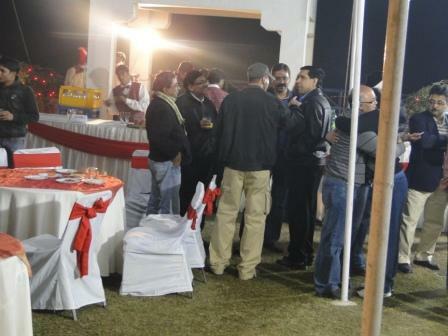 And then began something which is the inaugural item of all formal functions at BHU: the Kulgeet! The Kulgeet which only very few could remember the words (though as a ready-reckoner we always had it in our shirt pockets: it was printed in the Institute ID cards). Only some of us could hum along during the myriad BHU functions during our time (some accomplished singers who could sing it well were in great demand). But that all of us carried the Kulgeet close to our hearts over the last twenty-five years was obvious to any observer at G-11. Some eyes in the audience were moist, some were humming along, and all deeply absorbed in the melody. But this rendition of Kulgeet was with a difference. Actually many differences compared to our times at the campus. 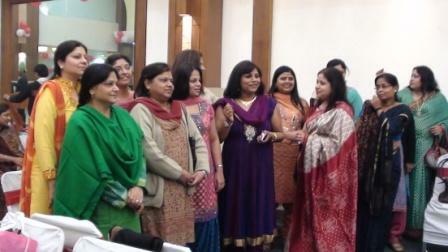 To start with there were no self-conscious girls fidgeting with the drapes of their saris as they got set to sing. Saris draped onto them by a dozen lobby mates in the Women’s Hostel (WH) and held together by a copious number of safety pins. There were no boys on the stage either. No one fiddling with the erratic microphone; and no cries from the audience. (Remember Au-Di-Ooooo…..!!!) The Kulgeet was delivered with the means of technology which did not exist twenty-five years ago. Namely, a compact disc, a lap-top, an LCD projector and Google Earth. While the first three may be obvious to all, the Google Earth bit may require an explanation. And that bears a connection with the afore-mentioned WH. I did not mention earlier that the Kulgeet was sung to the visuals on the screen projected by the LCD projector. The AV maker (was it you, Jayadev Chakravarti, V EcE?) did a great job of the AV- integrating the audio track with the montage of visuals of the BHU and IT campus and images from Google Earth zeroing in onto the BHU campus. It is just that Jayadev showed his bias to just a small portion of the campus layout, the AV would revert every few seconds on the WH on the Google Earth image, much to the amusement (delight?) of the 40-somethings in the audience!! And now my thoughts on this version of Kulgeet. This was the most soul-stirring rendering of the Kulgeet I have ever heard. Pure, clean and altogether melodious. Kudos to Anshu Tandon (4 Chem.) for having got this recording done by professionals in Lucknow, including a shehnai version! I can bet that over time this will become the official version of the Kulgeet. And that will be one of the lasting contributions the batch of 1985 would have made to the University. Ishpal Panesar (V Mech.) requested in a mail to the group after the reunion that there should have been a memento. 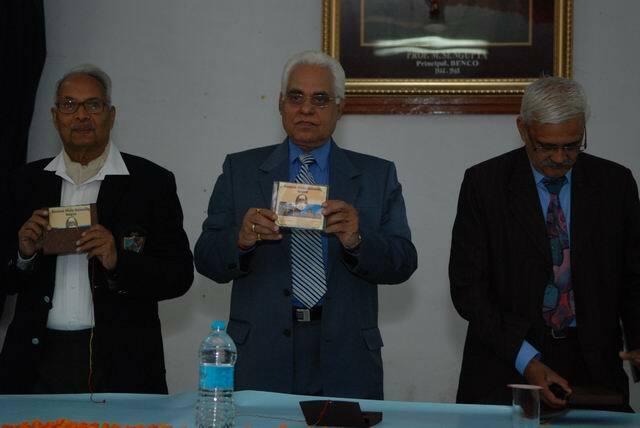 Dear Ishpal, to my mind, the CDs distributed at the venue is the best memento we could think of. Post the Kulgeet, Salil gave the welcome address in his fluent and highly textured Hindi, followed by talks from the various dignitaries on the stage. Prof SNU’s talk was a laughter riot! Remember “khuda hai”? It was then time for a break for tea and snacks. Back to G-11 after the break for some serious discussions on the way forward with our support to the Institute. Multiple suggestions followed; making donations to an already existing fund, donating to the Institute directly to specific and lasting contribution to the Institute exclusively by our batch. And yes, this included a discussion on good-old wi-fi connectivity in the hostels. 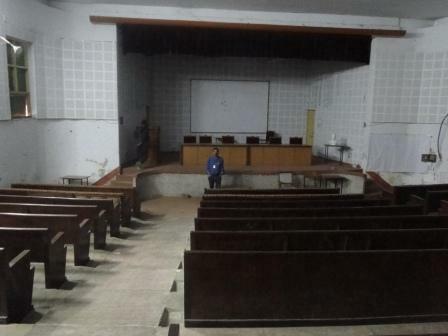 Some even mentioned the deplorable condition of the now mandatory two-seater hostel rooms and how we could support with foldable furniture for the cramped rooms. Talking of deplorable conditions, a refurbishment of the G-11 was also discussed. The discussion was getting long delaying the lunch and it was Milind Chalisgaonkar (4 Cera) to bring this session to a close in his tactful way. Now the time to get some food! We should have seen this coming, after all the menu was decided by Anshu who all know is a great connoisseur of food. And he had given a teaser trailer during the morning tea break with the fancily textured samosa (I discovered later it is called Jalidar Samosa) and the exotic kheer kadam. Besides lots of other snacks. Not only was the lunch spread fit for a royal feast, even the often ignored mundane stuff were taken care of. The plates were Corelle and not the routine (and often chipped) melamine. The water was served in factory-sealed plastic tumblers. And the roti was served hot, yes, it was tava phulka! Now for the fare on offer. Banarsi Lassi to start off with and Banarsi paan to sign off with. And in between tons of stuff like salads, “snack-ey” items like kachori and jalebi, and main course dishes like paneer tikka labadar, methi matar malai, dahi pakodi……, I don’t remember all the names now. And in case you have a sweet tooth, you could choose from rasmadhuri, rasmalai or kulfi faluda. Or you could have all the three. Like yours truly did. There is famous laddu shop in Kanpur called Thaggu ke Laddu. One of their slogans proclaims, “Jo khaye woh pachhtaye, jo nahin khaye who bhi pacchataye”. You would regret if you consumed the laddu– you would regret not having had more. You would also regret not having the laddus at all. And that summarizes what this lunch was all about! Probably we would get palangtod paan at dinner, I thought to myself munching on the banarsi paan, thoroughly satiated at the end of the meal. A stranger leaps onto me entangling me into his arms. I reciprocate the entanglement, and vigorously try to squeeze him closer. But our generous paunches get in the way of a closer hug. The initial salutation repeats itself. Two old friends have met! Only that we did not know who the other was. Twenty five years is a long time, long enough for these two friends to forget what the other looks like. Long enough for the respective paunches to show generous growths. 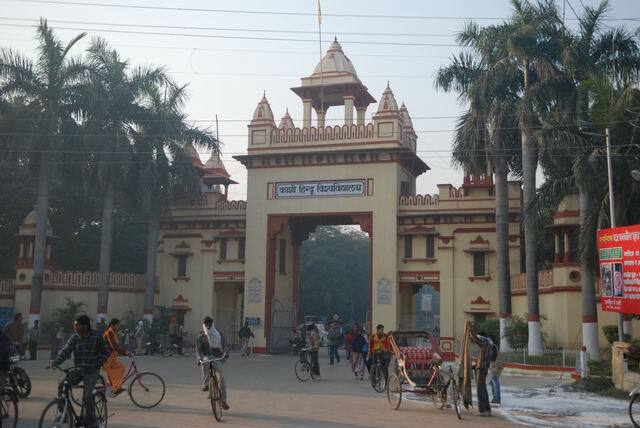 And long enough to get two hitherto unknown persons to hug each other, yes, I had not know the other person at all, all through my five years at IT-BHU, Varanasi. But how did it matter, we were together again! 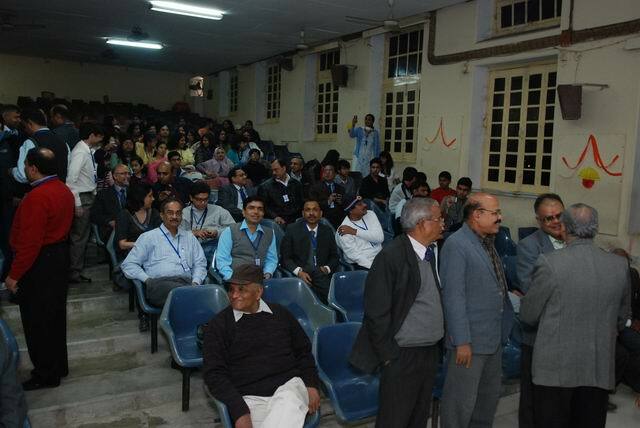 We were there together at the G-11 auditorium at IT-BHU, Varanasi, for the silver jubilee of our batch. “He is at this reunion, and he must be our batch mate! So what is the harm? 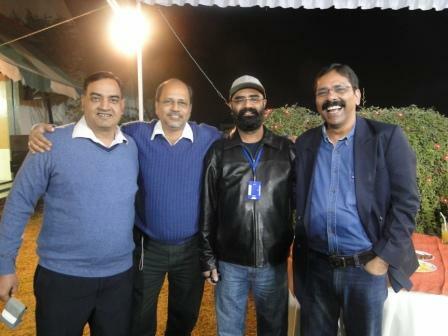 No harm at all, I agree; we were there for the silver jubilee reunion of our batch. 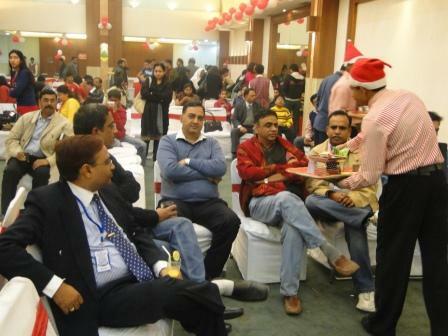 Some 120 batch mates had gathered in the campus, many along with their family members. This trend was to repeat itself over the new few hours at G-11. I must admit I was a total skeptic when this idea of a reunion was mooted. I even wrote on this blog about why such meetings were totally boring and you should never even attempt such meetings. Having vented my feelings, it was left to a batch mate who had read my past to make me change my plans. Someone who I barely spoke with at the campus but for many reasons- which I cannot get into now- keep speaking with him over the last 25 years, called me on a Sunday morning a few months ago when I was sitting bowed to my barber at my favorite hair-cutting saloon. In between the snips of the hair-cut I managed to utter “yes”, “totally agree”, “of course”, “what are you saying?” and eventually, “sure I will be there”! The first thing I did when I returned home that morning- even before the mandatory head-bath after a hair-cut, I sat myself down at my computer and “made-my-trip” to Varanasi for 23rd December. I said, “my?” Just omit that please. It was “our”trip, my wife insisted that the family accompanied me. I thought she would get bored, but my efforts to persuade her to forget about the BHU meet were in vain! Thank you Arun, (Anant Arun of V yr. Chem, if you don’t know him well enough), thank you! Arun, you made my haircut memorable! First things, first. 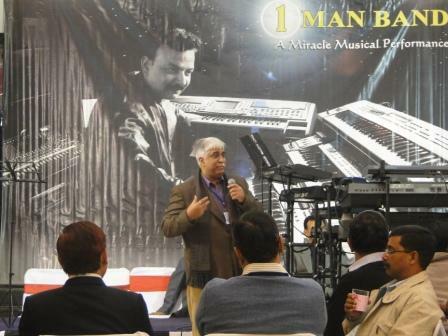 My good friend Salil Samshery was the one to make this meet possible. He created a Yahoo group of our batch mates about five years ago. He called each one of us and enlisted us into the group. Salil has a responsible job in the Himachal Pradesh Govt. but he persisted in this private venture in his spare time till he had nearly all our batch mates enlisted into the e-group. It was he who proposed a 25-year reunion. Multiple suggestions followed from the members and we then zeroed onto the date. Truth be told, the reunion date finalized was some 6 months after the silver jubilee. The distance was maintained so that our NRI friends could join us as well. And they did, some 25% of the gathering comprised the NRIs who took the opportunity of the long winter vacations in the USA and in the other countries, Canada, Hong Kong, Singapore and Egypt. Many (most) of the participants were those who were not the vocal types in the group and were there present for the sheer love of seeing their “lost” friends and catching up with their University and their Departments. 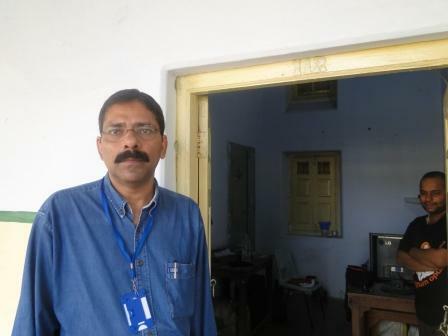 Anshu Tandon, a resident of Lucknow- a city some 275 km west of Varanasi- had taken charge of the ground level organization of the Reunion, more about his efforts, in later posts. What a hero he proved himself for the team! He was at that time enmeshed into a project very dear and important to him. More about this, later. A couple of weeks after the Reunion party is over, I think about the fairy-tale like situation I had travelled into. Some of us batch mates met in a dream-like situation after the lapse of a quarter-of-a-century, caught up and dispersed again. Some of the paris (fairies) met in the heaven, sung and danced and rejoiced, and then split away. Who knows when we will meet again! Will we ever? I will post later my other memories of the reunion. All I can tell you for now that I have much to write about! And then we reached Kalyanpur Police Station. The daroga (inspector) was a portly old man clad in his lungi and a chaddar. He was holding an object in his hand which he was diligently inspecting. His lackey stared at him admiringly. Our weary bodies were aching to find some place to sleep in when the daroga piped-up: “Kaun ho tum log, kya chahiye?” Our leader thrust the NCC documents under his nose and requested refuge for a night. “Thik hai”, he said, “so jaao”. Before we could figure out where we could sleep, he intoned ominously, thrusting at us the object he held in the dim lantern light. “Pata hai, yeh kya hai?” We stared closer. It was a crescent shaped object wrapped in gunny-bag cloth. “Abhi-abhi mila hai, kisika khoon hua hai issesey. Khoon. Samjhey, khoon. Murder!” Shivers went down my spine, a weapon of murder so close to me! The daroga had been busy sealing the knife for onward transmission. The lackey was nodding in admiration all the time as our group gaped at the murderous package. There is a Hindi saying:”Raam- raam kartey raat beeti.” That was my fate. As I am sure it was for others too. I am sure we all dreamt of a khooni chaku slitting our throats as we slept in the verandah of the police station between our NCC-issued blankets. “Jaan bachi toh laakhon paaye”, I thought to myself as I peddled furiously towards our next destination. That was a lot milder one, and a lot more welocming. We were headed to for lunch at one our fellow-cyclist’s home in Kanpur. He had planned his cycle adventure to end there. We reached there just before lunch. We never had a more luxurious hot water bath ever before in our lives and what a sumptuous lunch it was! Bye-byes done, we were off to our next destination. 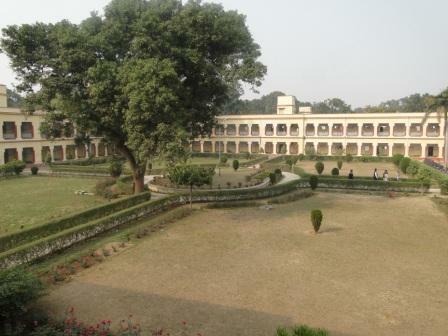 Sikandara. It was past 10 at night when we landed at the Sikandara Police Station. A scary, decrepit old building. And we were tired and famished and extremely scared, NCC dress notwithstanding. After the Kalyanpur P.S. welcome we were now expecting the worst. And we were completely taken aback when the daroga welcomed us, albeit sternly. “Aao, aao.” He barked. “Kahan sey aaye ho?” Our leader showed him all the NCC documentation we had. And the daroga’s stern look softened a bit. I wonder whether he understood the documents. And then dropped a bombshell: “Darr nahin laga, yeh Phoolan Devi ka ilaqa hai.” Phoolan Devi’s infamous Behmai massacare had taken place a few years ago. Here she had avenged her slight in the earlier years by gunning down dozens of innocent inhabitants of Behmai village. We were aware of this one. But none knew that Behmai came under the jurisdiction of Sikandara PS. One of us gathered his wits and said, “No, we were not scared. Phoolan is in jail now.” Indeed she was, taken into custody after much drama only a few months ago. The daroga now actually smiled and offered: “Sona hai? Toh yahaan so jaao.” And he gestured toward a crummy looking room next to his desk. “bahut achha hai, bahut achha hai.” I was wondering whether he was referring to his own reaction or was referring to the room. He resolved the matter for us very quickly. “Yeh hamaarey thaney ka lock-up hai. Abhi thodi hi der pehley ek kaidi chhoota hai yahaan sey. Puwaal taaza hai bilkul. So jaao aaraam sey.” He was reassuring us that the hay on the floor was fresh and would keep us warm. As an added incentive he told us that the previous occupant of the lock-up had just left and the hay was fresh! And then in a sudden fit of extra generosity he enquired: “Have you had something to eat?” In the urge to reach our night-halt destination, Sikandara, we had not had the time to eat anything. The evening tea and snack on the highway was the last we had had. We were famished, and we told him as much. The kind soul instructed his assistant to fetch us some aloo sabzi– the left-overs from their dinner. Said the generous daroga: “The sabzi is dry, add some water to it if you wish. And here is some atta, if one of you knows how to make rotis, knead the atta and there is an oven which is still burning. The cookery expert amongst us got down to kneading dough while the rest busied ourselves kneading our muscles with the aid of some Iodex. Some dozed off on the hay bed. After a satisfying midnight meal, we all crawled onto our thick hay carpet, unrolled our NCC-issue blankets and dozed off to sleep. It was one of the craziest activities I have ever taken part in. 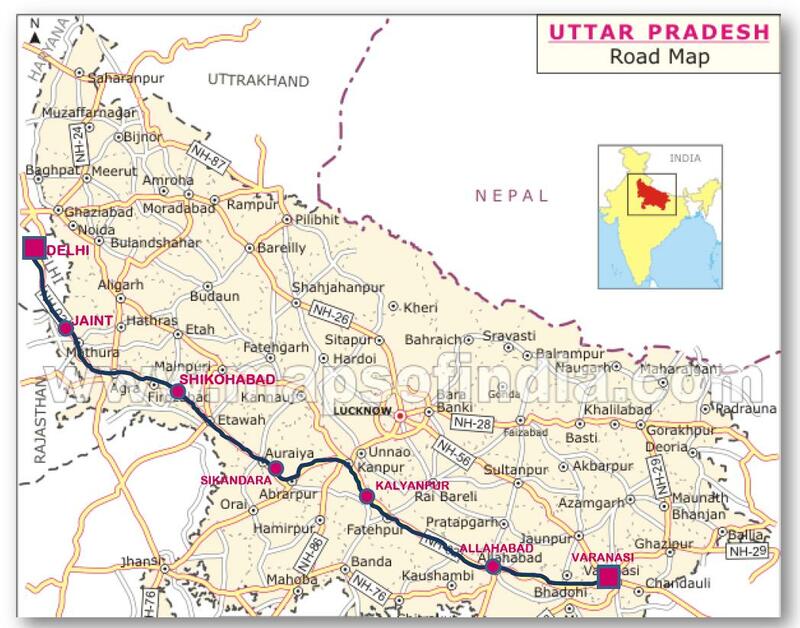 I cycled from Varanasi to Delhi by road. On a bicycle. In the middle of winter. A ride of about 750-odd kilometers. With hardly any support systems save for the few classmates as companions, a rudimentary first aid kit and some puncture repair paraphernalia. The plan was simple, simplistic really, on hindsight. This trip was undertaken in 1983-84 when we were engineering students in the fourth year of our five year course at IT-BHU, Varanasi. (Those days engineering was a five-year course in most places). There was a largish gap between our theory and practical exams and we decided to make good this opportunity by seeing the world a bit. We had a classmate, Satish, who had done all the planning. 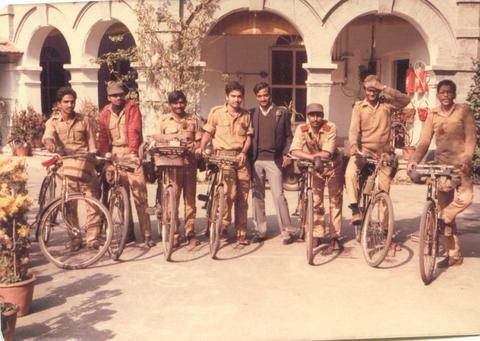 We would leave Varanasi early morning on 29th Dec 1983 and reach Delhi on the evening of 3rd January 1984. Satish had not only done painstaking preparations for the trip but he had also gathered a bunch of seven of us. 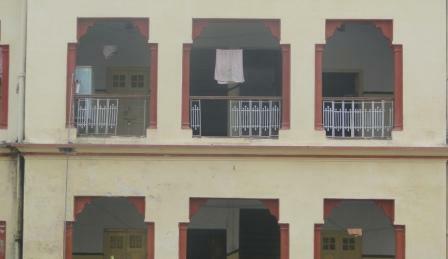 Six were to go all the way to Delhi from Varanasi while one would stay back in Kanpur, his home town. I was perhaps the only non-NCC guy in the group. With nothing to protect us but our youthful enthusiasm and those hastily acquired NCC kits. Those of us who were not members of the NCC enrolled as one, if not for anything else but to get the NCC standard issue gear; a blanket, a jersey, boots etc. And more importantly, a letter from the campus’ NCC commandant certifying us as bonafide NCC cadets and that others should help us in case we were in need. We had decided that we will have one leader and who we would follow come what may. We instinctively knew that it would be chaos if we did not have a leader, a single person whose commands we needed to obey. Satish being the one who had planned the entire trip was the unanimous choice; and he was the “most-NCC” of us all! “C” certificate and all that. With a demeanour to boot. We started our trip from BHU’s Vishwanath Mandir at 5.30 in the morning. We did have a couple of friends to see us off. Puja offered, photos taken, bye-byes done; we were off! The night before we left, some friends had come to wish me all the best. They all placed bets among themselves on whether I would complete this journey. I was not exactly the physically active types, and hardly the type to cycle all the way to Delhi from Varanasi. Most of my friends were pretty sure that on day two I would be on way back to Varanasi, probably via a hitch-hiked return trip on a truck or worse still a dehydrated and fatigued apparition of skull-and-bones in an ambulance. I am sure some would have even replaced the ambulance in their imagination for a hearse. Since you are reading this post some 27 years afterwards, you know that I have survived to tell the tale. The plan- our leader Satish’ plan- was to cycle about 125 kms a day and halt for the night at a police station. Our Day one ended at Allahabad. A government guest house was made available to us thanks to the influence of a friend’s father who was a senior government officer. So the lodging and boarding was well taken care of. But when we reached the destination we discovered that our bodies are made of the elements, lead being a prominent one. Yes, our legs were leaden! Most of us barely had the energy to park our cycles and we all collapsed onto the nearest horizontal space available. Satish went out to enquire about the dinner etc. When he returned, he announced the meal arrangements and also the time of departure for the next morning. Six am, he pronounced. A collective groan all round, but we had no choice. We had all agreed to follow our leader. So Six am it was that biting cold morning of 30th December 1983. Seven idiots, with aching calf muscles donned in their NCC gear setting off for day two of the expedition. Destination for the night: Kalyanpur police station. The first hour was a torture. All the muscles were groaning in unison. Head was telling me, go back you idiot. What are you doing here this winter morning on the highways of UP? You ought to be in your hostel bed in Varanasi curled up with a book on mechanical metallurgy, or thermodynamics, or whatever seizes your fancy. (I refrain from admitting here what really seized my fancy at that age). The heart rebelled: “You twit, you want to get back and prove all those stupid hostel-mates right by returning after 24 hours in the wilderness?” “No way, my heart told me, “no way”, as I continued to peddle on my old hand-me-down Avon cycle. I am sure the others had similar introspective chats with themselves. None surrendered. After an hour or so, my body settled to the rhythm of peddling, my muscles found their strange abuse familiar. I was singing as I cycled along the highway. I still remember the song I would sing aloud to myself often during the trip: “Zaroorat hai, zaroorat hai, zaroorat hai; ek srimati ki, kalavati ki..”. That old song of Kishore Kumar from the 1962 movie Manmauji. Maybe it was the simple words, maybe it was the simple tune, that was the song I had used whenever I was asked by my seniors to sing a romantic Hindi song during my ragging days some three-and-a-half years earlier. Or maybe it was the song’s following line which- in those conditions- made me peppy. The line goes: “sewa karey jo pati ki..” I was far from having a patni, but the whole thought of a nubile woman massaging my calf-muscles at that time of the day was enticing. And it is this thought which made me brave on. Another motivation was to have an hourly stop at the road-side dhaba to gorge on some sweets and some water. Mostly pedas or jalebis. Washed down with liters of water from whatever receptacle the water was held in at the dhaba. Amrit. Pure!